Demo for "Indiana Jones and the Fate of Atlantis". Made by enthusiastic fans of the game. :) The story is set in 1939, when adventurer Indiana Jones is on a worldwide race with Nazis for the lost city of Atlantis. Indy teams up with psychic colleague Sophia Hapgood to preven Hitler's minions from capturing the ancient power of the Atlanteans, which will determine the fate of a world poised on the brink of war. - Story by veteran Hollywood screenwriter Hal Barwood, co-writer of Steven Spielberg's classic blockbuster Close Encounters of the Third Kind. 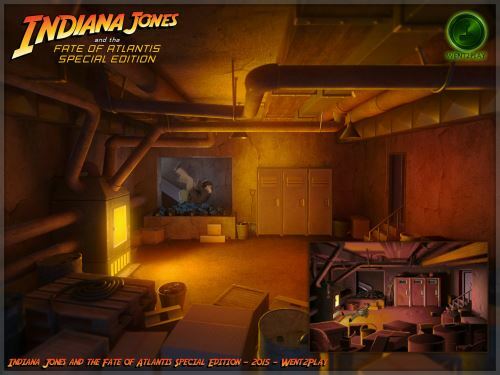 - Players get to BE Indiana Jones on a thrilling quest for Atlantis! - Explore ancient ruins & solve mysterious puzzles! - Beat the Nazis in pursuit of the ultimate power to determine the fate of the world! - Brand new HQ Environments, Characters and VFX. - High quality music & sounds. - Voice overs made by professional actors. Wenn man nach der Szene wo Indiana Jones ausgeraubt wird (in seinem Büro), zurück ins andere Gebäude lauft, kann er irgendwie aus der Kulisse laufen und nach dem kann man ihn nicht mehr steuern, die Büro Tür ist irgendwie auch verbagt.... aber sonst super gelungen macht echt Spaß.